Lines from Linderhof: Spring Bouquet and a Peek! There are always flowers at Linderhof but come Spring, there often are more bouquets than one on the breakfast room table. But it is always my favorite place for a bouquet. For we do spend a lot of time in the breakfast room. Japonica and white daffodils in a blue and white pitcher. 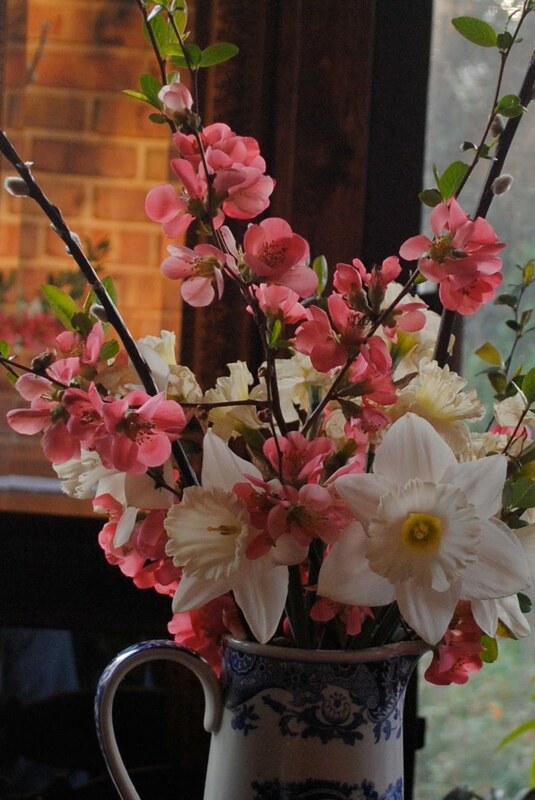 One of the first bouquets of spring and so welcomed. And the peek . . . . It's something new at Linderhof and I'll tell you soon what it is but it IS pink!!!! So it's perfect to take a peek at my new pink on Pink Saturday! Please join Beverly at How Sweet the Sound to see what other pinks there are this Saturday! Oh the bouquet is GORGEOUS, but that "something new" looks like something wonderful! As I write I can see the Star Magnolia blooming in the back yard - I can't get enough of flowers - any flowers - at this time of year. Pretty bouquet, love the colors you used.. New and pink, huh..
don't you just love all the choices we have to use with our fresh spring flowers! yours are beautiful. would love to be sitting in your breakfast room about right now with a blanket and my fav author james patterson!